As you know, I’m very reluctant to promote consumer products on this blog. Old Money is about being, not buying. Still, when a product exhibits value, classic design, and enduring quality, it warrants consideration and notice. Allen Edmonds, established in Belgium, Wisconsin, almost 100 years ago, is a great example of an Old Money essential. Their men’s shoes are built, as a salty acquaintance of mine put it, sturdy as a brick outhouse. And I cleaned that up for publication. (Wink, nod.) What his description lacks in elegance, it makes up for in accuracy. I’ve owned three pair of AE’s for more than a decade now. It’s simply impossible to wear them out if you provide them even the most minimal of care. The company has retail stores around the continental U.S., but everyone I know simply orders online through the AE website. What’s more, Allen Edmonds offers a recrafting service. If you’ve worn your AE’s into the ground, as many men have, and don’t have access to a quality shoe repair vendor, you can simply send them back to the AE factory. Craftsmen there will resole and refurbish them, bringing them back to an almost-like-new condition. But it will be a long time before you get to that point, trust me. They’re versatile, as well: proper with a suit, dashing with a pair of jeans. Personally, I’m a Strand man, but you’ll find your own favorite. 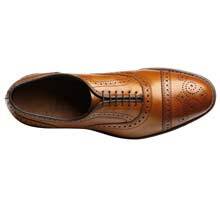 And remember this: you can still dress casually in a quality pair of shoes, but you can’t be really dressed in a crappy pair of shoes. AE shoes are not inexpensive, but in this case, you really do get what you pay for: a pair of shoes that will last a lifetime and never go out of style. Allen Edmonds shoes. An Old Money Essential. I strongly prefer Allen Edmonds w/ Dainite soles because the streets where I live are often wet. Leather soles wear out faster on wet pavement + Dainite grips wet sidewalks much better.